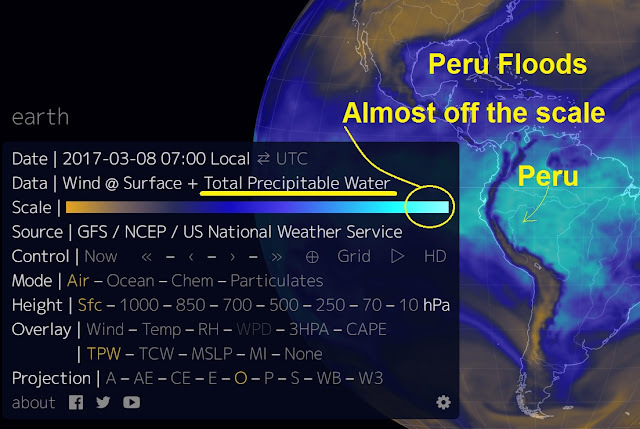 Earthwindmap showing the incredible amount of rainfall which fell earlier on in the month, the amount is almost off the scale, click to enlarge. 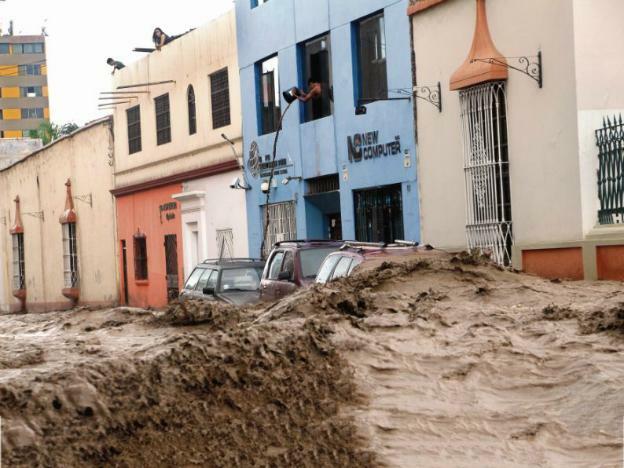 Peru's Defense Minister Jorge Nieto on Thursday confirmed the number of lives lost to torrential rains, overflows and floods lashing the country has further jumped to 84. "We regret to report the passing of five more Peruvians. Trujillo was one of the most affected areas in Peru. More than 23 people died in this area due to the constant floods and heavy rains. Yesterday, we had 79 fatalities, and today these add up to 84," Nieto told State-run TV Peru station. The government official also noted 20 people are still missing and at least 79,200 citizens have been injured. In terms of infrastructure, 12,987 properties have collapsed, 149,541 are damaged and 13,974 have become uninhabitable, the National Emergency Operations Center's (COEN) latest update revealed. On the other hand, the Defense head informed Chancay River (northern Lambayeque region) has been declared under red alert due to its rising levels. An orange alert has been issued for rivers Piura, Jequetepeque, Mala and Cañete. Nieto said the rest of rivers -including Rimac River, which burst its banks flooding km 44 of Central Highway- post normal flow. In this sense, he explained Rimac River's overflow was not triggered by increased flow, but rather by accumulated humidity and erosion that caused the ground to collapse. This notwithstanding, he affirmed Lima citizens "are reassured."